Really? Two of these crazy bastards in one day? Yeah, well this one has been lying around a couple years as well, and I always kept telling myself, no way you're going to leave this unfinished, you're way too far along already, too much work has gone into this, you're already more than half-way through. But no. Never made it past below the waterfall. 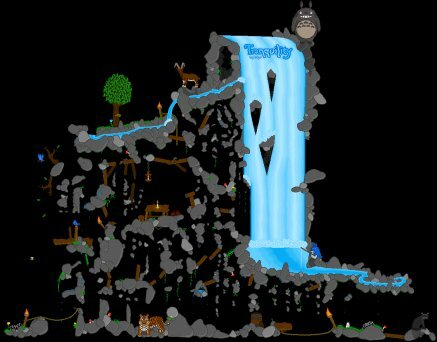 The map was designed with the waterfall as the centerpiece and the puzzles going on on either side, but the bite turned out just a bit too much to swallow. So today I scraped together every last remaining bit of motivation I could muster, made sure everything was free of shortcuts, added a couple more details and dropped the finish by the raccoon. This is my largest map-making effort ever, by far. Countless hours of pixelling, puzzle designing and playtesting have gone into this. Everything is hand-drawn by myself this time (just look at all the messed up proportions and perspectives and it's easy to picture! ), no sprites or anything. And yes, I'm aware mushrooms don't grow on ceilings! So it's another one of those puzzle maps. You start on start and finish on finish and try to make your way over there just by walking and jumping. You can use the attached scheme for comfort, it contains ropes and parachutes and the like so you can get back to where you were if you happen to fall down. Every jump on the entire map can and must be made without losing your turn on it. Skipping ahead by dropping down and losing your turn counts as not having finished the map (though I'm pretty sure that's not even possible on this one). There's one thing you may want to know: If you've played Yoshi's Merciless Island (#4030" target="_blank">#4030) or Mega Man Madness (#21907" target="_blank">#21907), they both absolutely pale in comparison to this one in terms of difficulty. I've gone all out here, I tried to come up with the craziest layouts within my mind's capacity, so if you manage to defeat this map, I'll really take my imaginary hat off to you! - You should be very familiar with all the jumps and bump jumps in the game (ideally you should have a rough idea of where your worm will land with each jump before attempting it to avoid wasting time on jumps that will definitely lead nowhere), as well as with how worm positioning works (the way the game keeps track of where the worms are is much more detailled than just the sprites' positions on the screen). - Most of the map can be broken down into several sections that are seperate from the rest and have an entrance and an exit. Try to identify them so you know where you are likely to go next. - There are a couple of places where it seems like you can go in more than one direction. In such cases look at the options and try to analyze them before just walking ahead. Are you likely to skip an entire section if you were to go this way? It's probably the wrong way and a dead end. - Within a section, even if you are very near its exit, this does not necessarily mean that you will actually be going there shortly. For example, if you made it through this section and you noticed that you skipped a couple of rocks, you'll likely have to work your way in the other direction again and find another vantage point to get to the exit. The vast majority of little things on this map are there for a reason. It's on you to figure out what's just graphical detail. - This may sound pretentious and obvious, but use logic. Try to get in my head and think as a puzzle designer. Why did I put that there? Is this opening here just to mess with you? Stuff like that. Favorites: This map is on the favorites list of 5 users.